The UBC Okanagan Campus is located in the ecological setting of the Okanagan’s Very Dry Hot Ponderosa Pine Zone. Climate adaptation planning at UBC’s Okanagan Campus is fundamental to address climate change impacts. Sustainability – Campus Planning & Development is currently integrating adaptation measures into key plans, such as the Integrated Rainwater Management Plan (IRMP, 2017). The IRMP assesses and proposes measures to responsibly manage rainwater that falls on campus, thereby mitigating the impacts of the built environment on rainwater management. Climate modelling was an integral component to rain water modelling flows and volumes and associated IRMP recommendations for future campus development sites. Mean annual precipitation (Kelowna Airport) is 298 mm, of which 102 mm (34%) falls as snow. High intensity rain tends to fall in the spring and summer seasons after the snow is gone. Approximately 25% of the campus has a high environmental sensitivity, representing primarily woodland and wetland ecological communities. 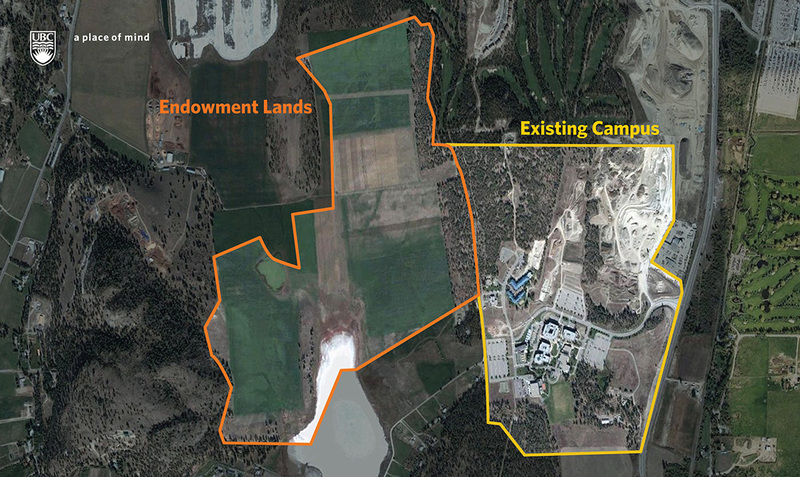 With a diverse landscape of pine woodland and open grassland, the campus contains ecosystems and has plants and wildlife identified as being species at risk. Among those documented on campus are the Great Basin Spadefoot Toad and the Western Painted Turtle, which have been observed in certain rainwater features making maintenance more challenging and costly. Understanding potential changes to the Okanagan climate resulting from climate change will also need to be considered in planning the IRMP for the campus. 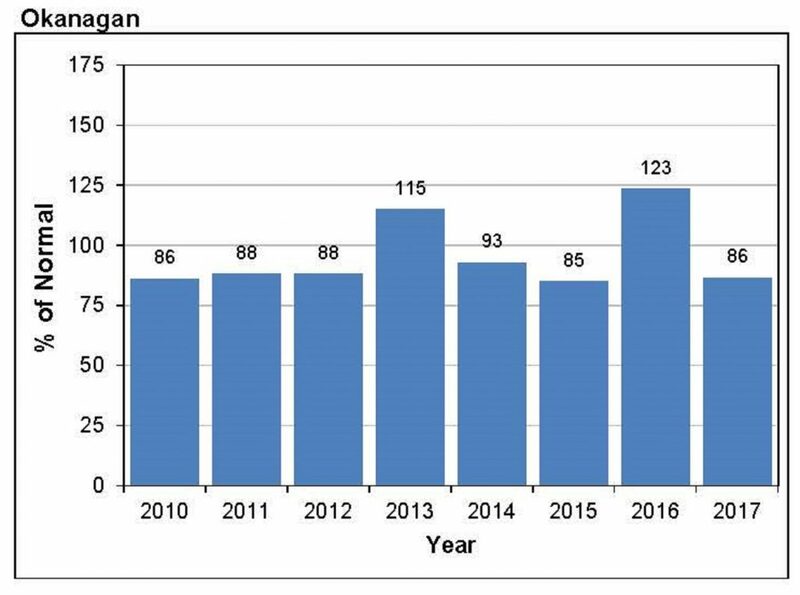 Trends for the Okanagan Region are expected to include increased annual temperature, increased annual rainfall (likely in shorter and more intense rainfall events), and decreased snowfall and snow pack leading to an overall decline in groundwater recharge and base flows during the summer. Positioned along the ridgeline, the campus has three distinct benches and slopes and several low-lying areas that have developed into rainwater retention areas and wetlands. Soil conditions and permeability vary largely throughout campus. In general there is a coarse granular aquifer that is exposed in the lower elevations in Innovation Precinct, which is then capped with a thick layer of mixed silts, clays and cobbles in the higher elevations. In the highest elevations along the ridge is some bedrock. Hydrology has been extensively modified through historic development within the campus core. 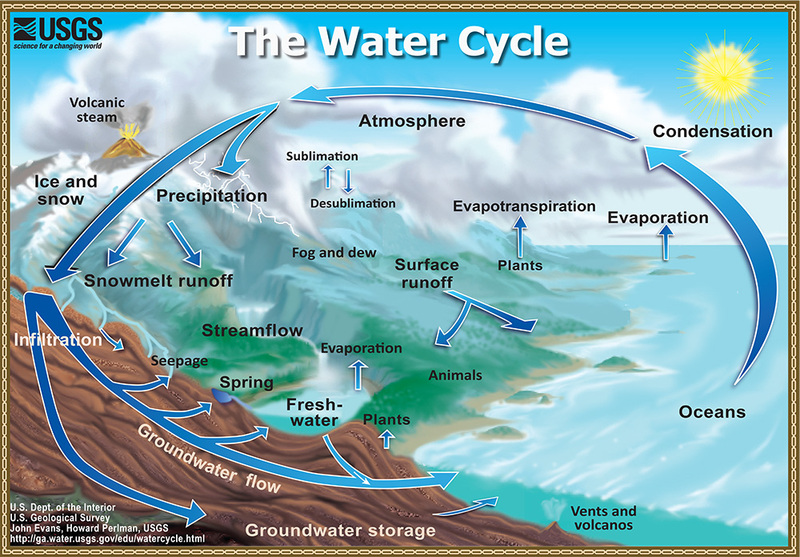 The Water Cycle image depicts the cycle of water movement of water on, in, and above the Earth. The water cycle on campus is impacted by many factors including rainfall intensity, permeability of surfaces and soils and the volume of water that can penetrate and infiltrate from the surface. Promoting infiltration in a dry climate is important to recharge groundwater supply. Weather patterns through February led to modest shifts in snow pack conditions across the province. In the South Interior and south-east BC, snow basin indices saw increases in values in March from the previous month. The provincial average for all March 1 snow measurements is 85% of normal, which is an increase from the average of 79% in February. Snow basin indices for March 1, 2017 indicate a near-normal snowpack (80-100%) for the Okanagan. With cooler than normal temperatures through this winter, low elevation areas have been cold enough that they have experienced a greater proportion of precipitation as snow than normal. For example, most Environment and Climate Change Canada weather stations that record snow observed 2 to 8 times the normal snowfall amounts in February. This season’s snowpack can be considered “upside-down”, with higher than normal snowfall occurring at low elevations, but below-normal snow at high elevations. This is a result of colder than normal temperatures which have resulted in several low elevation precipitation events occurring as snow rather than rain. However, seasonally dry conditions have resulted in lower than normal snowpack at high elevations despite the colder conditions. Increased snow at low elevations plays a limited role in seasonal flood risk or water supply into the spring and summer.